Gnomenclature - ZineWiki - the history and culture of zines, independent media and the small press. 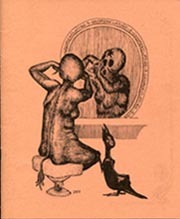 Gnomenclature is a science fiction fanzine by Al Curry (1949-2008). Gnomenclature was a perzine circulated among the science fiction fandom community. It was published in Cincinnati, Ohio, U.S.A. in the 1970s. Issue three was released in 1978, and issue four in March 1979. Cover art was by Dianne K. Fischer (#3), and Marla Gold (#4). Contributing artists included Dianne K. Fischer, Marla Gold, Terry Jeeves (ERG), and Barry Kent MacKay. Letters came from Mike Glicksohn (Energumen, Xenium), Paula Gold (Risteria), George J. Laskowski, Jr, Denise Parsley Leigh (Graymalkin), and Harry Warner, Jr. (Horizons). Al Curry was also one of the co-editors of Quantum. An interview with Al Curry by Dave Locke appeared in Outworlds in 1988. This page was last modified on 3 January 2018, at 15:13.